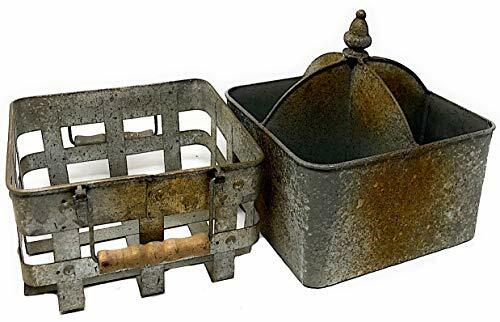 The world s first bucket organizer, the original Bucket Boss. 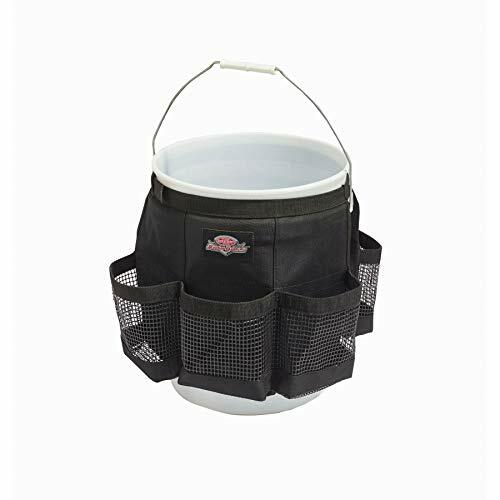 Fits any 5 gallon bucket, providing instant organization with 30 pockets for tools and 3 interior loops for hammers and pry bars, all while keeping the bucket center open for bulk storage. Made of durable 600 denier poly ripstop fabric. The Wash Boss turns any 5 gallon bucket into an organization center for your car washing supplies. Attaches to the outside of your bucket to keep the center open for soap and water. 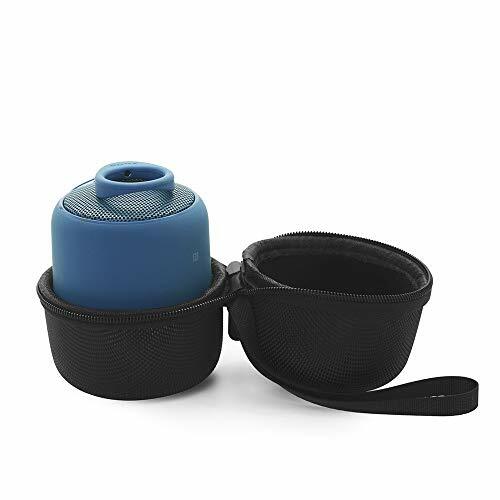 Includes six large waterproof mesh pockets for storage, and a ring for holding a rag. This heavy duty dairy/storage crate is a must have when organizing your home and garage. 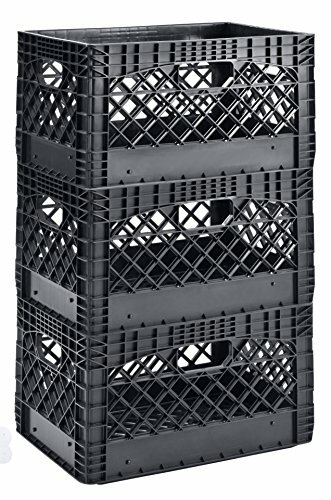 With a size that's 1.5x bigger than the standard Milk crate; use it to store all kinds of small and medium items. Its heavy duty construction makes it perfect for all your storage needs. 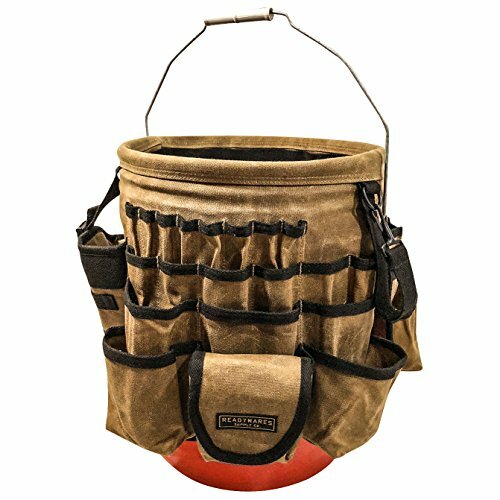 Custom Leathercraft's 61 In & Out Pocket bucket pockets turns any standard 3-1/2- to 5- gallon buckets into a portable multi-functional organizer. Made of durable, ballistic polyester. 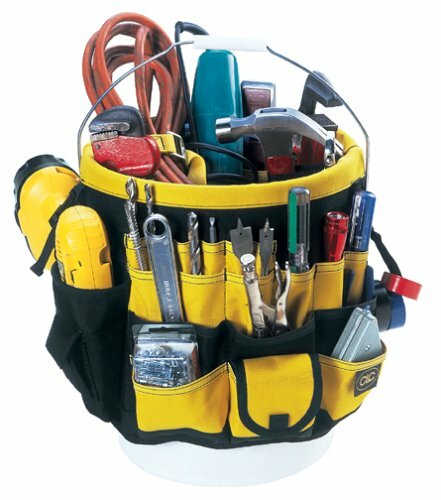 With 36 triple row outside pockets and 25 double row inside pockets to organize a wide range of tools and accessories. Drill holder with side release buckle security strap. Tape loop to dispense tape without removing the roll. Deep interior pockets help you organize large handle tools. Extra layer of fabric to reinforce the rim of the bucket pockets and bar tacked at all stress points. HEAVY DUTY IN & OUT BUCKET: This CLC in & out bucket is made of ballistic polyester for added durability. 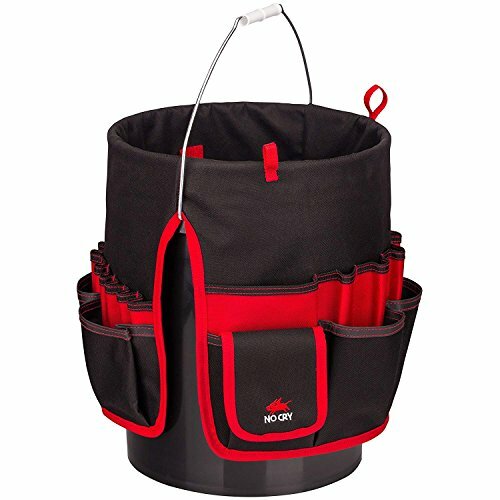 61 POCKET IN & OUT BUCKET: 36 triple row outside pockets, 25 double row inside pockets to organize a wide range of tools and accessories. DRILL HOLDER: This CLC in & out bucket has a drill holder with side release buckle security strap. FITS MOST STANDARD BUCKETS: This Custom Leathercraft in & out bucket is designed to fit most standard 3.5 to 5 gallon buckets. DURABLE IN & OUT BUCKET: With an extra layer of fabric to reinforce the rim of the bucket pockets and bar tacked at all stress points, this in & out bucket is ready for any job. 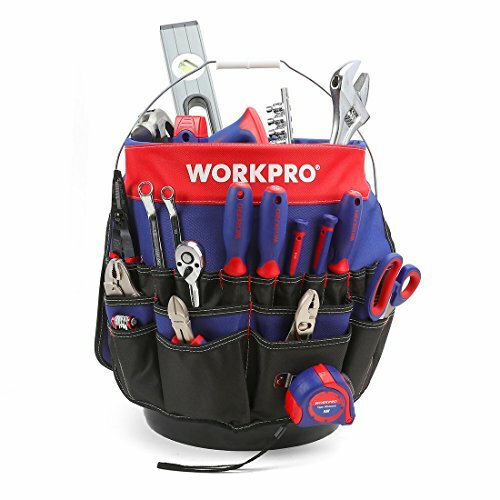 The WORKPRO bucket tool organizer is designed for bucket tool organizer. 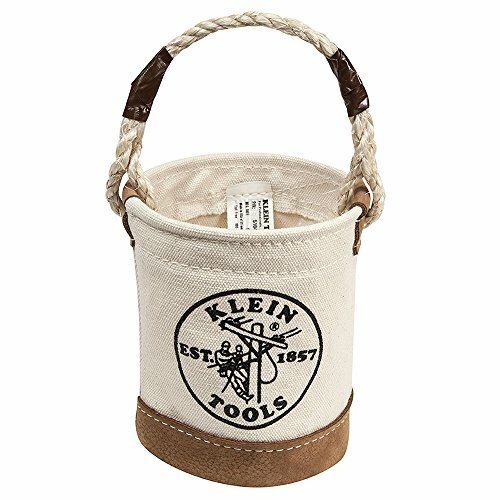 The organizer gives you the ability to hold plenty of your hand tools in a 5 gallon bucket. 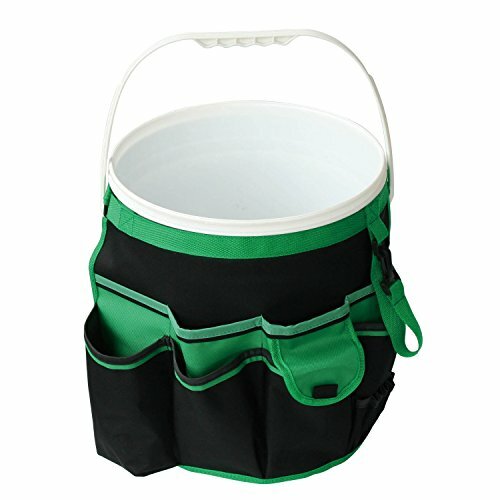 Made of poly rip stop/600D poly material and built with 51 pockets, the bucketed fits any 5 gallon bucket. There are also 2 loop handle straps for hammers, drills, pry bars and long tools. Internal heavy duty water resistant material, external constructed using high tenacity fiber technologies, making it both lightweight and strong. Tape measure clip and tape loop included. Klein Tools doesn't just make great products, we make great products that stand up to the demands of the professionals who use them every day ... Since 1857. Get organized with the Apollo Tools Bucket Tool Organizer. This Bucket Tool Organizer is made of single layer 600D oxford cloth w/PVC inner layer and will convert your 5 gallon bucket into a tool organizer. It is perfect for keeping your tools organized, protected and easily accessible. 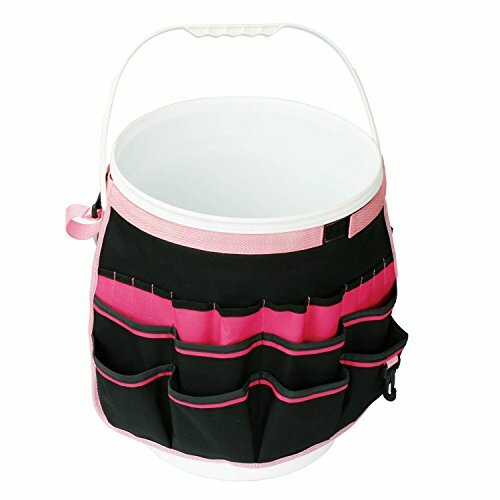 With the hook and loop fastener strap it fits any 5 gallon bucket and makes carry tools a breeze. COMPETITIVELY PRICED. Apollo Tools' bucket tool organizer is an excellent value considering its design, craftsmanship, durability, warranty and low price. APOLLO TOOLS' LIFETIME QUALITY GUARANTEE: As for all our garden products, Apollo Tools stands behind the quality of its products, they should last a lifetime under normal use. peg board that mounts onto most walls and is light is weight. Ideal for mounting in garages and/or sheds. With removable bins which are conveniently and easily accessible. Includes 9 Small Red Bins, 9 Small Yellow Bins and 12 Large Blue Bins. 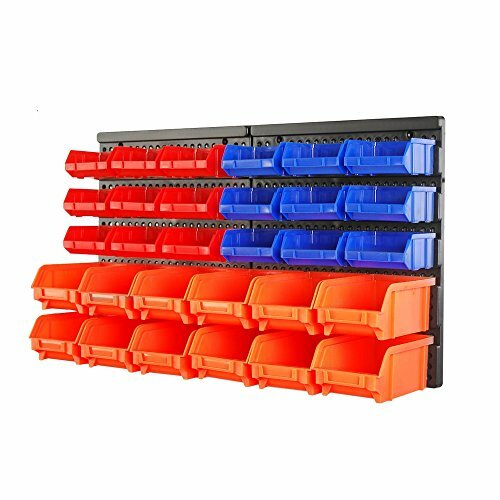 This 44 Bin Wall Mounted Storage Organiser is perfect for home or commercial garages, keep all your bits & pieces stored away for immediate and easy access. Quickly and easily organise your work area with this great wall mounted storage organiser. With open drawers you'll be able to be able to identify what you have and which drawer it's stored in with accuracy and simplicity. Clean up your work area and speed up your work process with this excellent parts rack. Ideal for storing nuts, bolts and other small parts. This Kit comes with 12 Tool Holders, 16 Small bins, 8 Medium Bins and 4 Large Bins in two colours. The detachable bins are easy to label and come in several sizes to accommodate any tool. Get your workshop organised today! A Great Birthday, Christmas or Fathers Day Gifts, a unique gift for the home mechanic. Buy yours now! Includes 16 Small orange Bins, 8 Small blue Bins and 4 Large orange Bins. Ideal storage for hardware, tools, household or craft items. Made of tough polypropylene. Bins can be stacked or used on shelving. 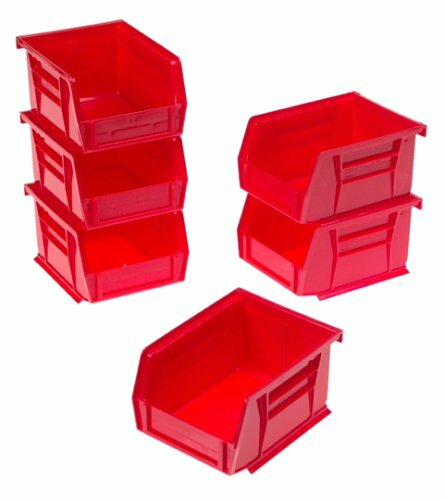 6 Pack Color: Red Ideal storage for hardware, tools, household or craft items Made of tough polypropylene Bins can be stacked or used on shelving Dimensions: 4-1/8" x 5-3/4" x 3" Made in the USA. 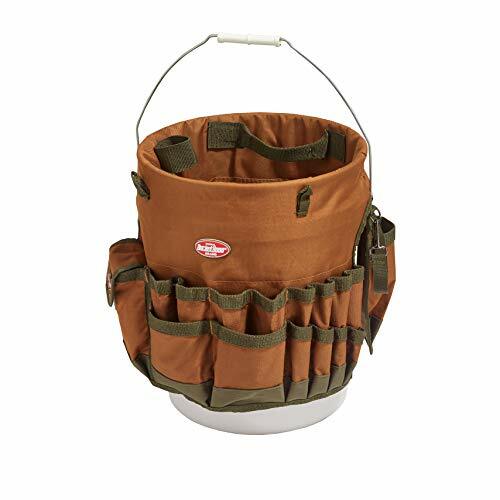 The NoCry Heavy-Duty Canvas Bucket Bag and Tool Organizer fits easily over and inside a five or three gallon bucket to turn it into a portable tool organizer designed to hold tools, equipment, fishing tackle, and more. Made from durable 600D canvas and backed with waterproof materials, it's lighter and more portable than the typical tool box. You'll find yourself reaching for this bucket bag again and again. A pocket for every tool. This canvas bucket tool organizer has 5 loops and 35 pockets of varying sizes that hold screws, nails, drill bits, and tools. Nine pockets are found on the outside lower level and eighteen more just above them. Inside there's another eight pockets and five open tool loops. It's an economical alternative to expensive tools boxes, totes and caddies, and also lets you work with one hand free. A tool organizer that won't easily wear out. Whether you use your bucket tool bag for crafts or for heavy-duty work projects, you want to know the materials and stitching won't give in at the first signs of stress. That's why we double stitch every seam and pocket and back the heavy-duty canvas with waterproof material. This is one tool tote that will last and last. Keep one at home, a second in your truck, and a third at work. NoCry's tool organizer is a great value and costs significantly less than standard tool boxes. That means you can keep one wherever you use your tools-at home and at work. Use it for crafts, plumbing and painting, or for professional projects by electricians, mechanics and other craftsman. It's also great for gardening..
A POCKET AND LOOP FOR EVERY TOOL. 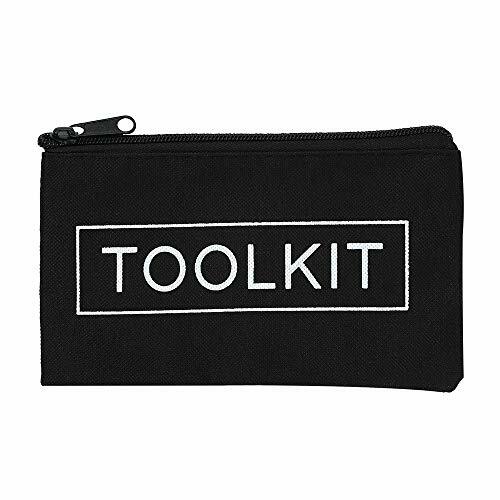 This tool caddy has 5 loops and 35 pockets of various sizes-from small pouches designed to hold drill bits and screwdrivers to large pockets big enough to hold bulkier tools. Two layers of both open and closed pockets on the outside, one layer on the inside. Your challenge-should you choose to accept it-is to fill them all. WATERPROOF AND MADE TO LAST. This bucket tool bag and its pockets are crafted from 600D ballistic red and black canvas, reinforced with a heavy-duty waterproof material on the back to protect your tools while sitting on wet surfaces. All seams are double stitched (triple stitching for stress points) to endure the weight of heavy tools that can stretch and stress other tool bags. A MORE CONVENIENT WAY TO STORE YOUR TOOLS. The NoCry Bucket Tool Bag maximizes the space on the inside and outside of your bucket-allowing you to carry and organize your tools more effectively. It turns a standard three or five-gallon bucket into an organizer that holds tools, fishing tackle, cleaning, craft and paint supplies and other equipment. 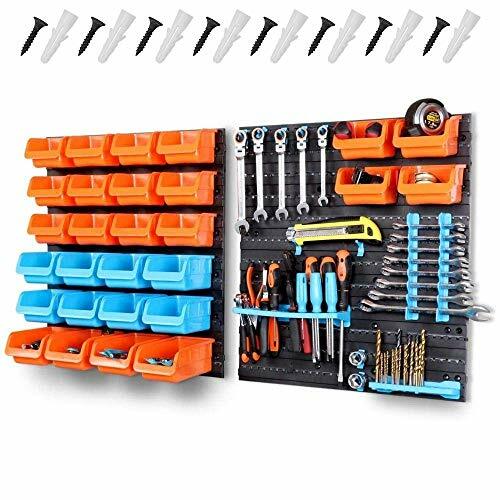 THE TOOL ORGANIZER THAT HELPS YOU WORK FASTER AND SMARTER. 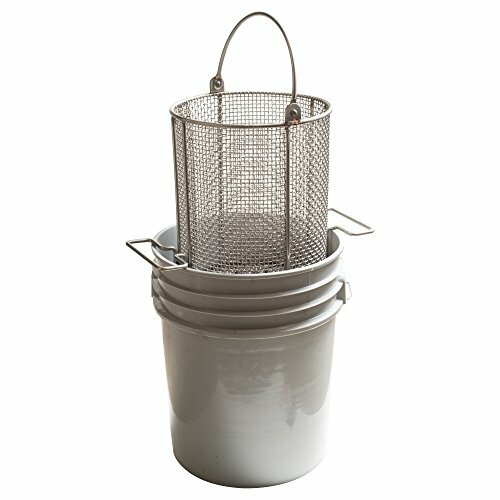 We've designed this bucket organizer with craftsmen, painters, electricians, gardeners, plumbers, mechanics, linemen, car wash employees and others in mind-anybody who wishes to maximise the practicality of their bucket, increase storage, and have easy access to their tools so you get more done, faster. Let us know how we've done! YOU'LL LOVE IT OR GET YOUR MONEY BACK. Your No Cry Heavy-Duty Canvas Bucket Bag and Tool Organizer comes with our no hassle guarantee: If you experience an issue, we'll replace it or give your money back. Quick, simple, easy. Note: These bins are lightly used These Industrial Strength Stacking Storage Bins are a great solution for warehouses shops or around the home to store just about anything for easy access. The bins stack on the floor or on a shelf allowing you access to contents. Bins hold up to 75 pounds so they can really be loaded. Side handles make carrying and transporting easy. Made in the USA by Akro Mils these heavy duty bins will last for years. 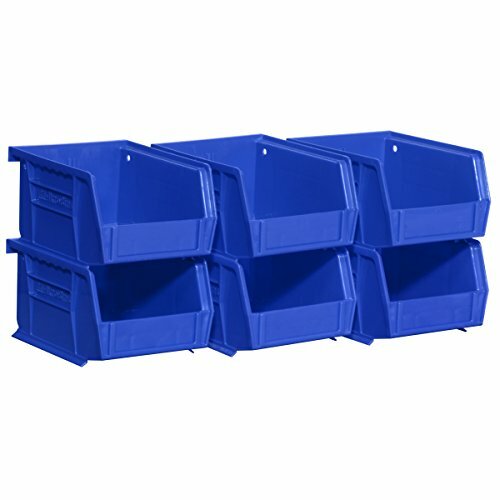 Industrial Strength Stacking Storage Bins Feature: Note: Bins are slightly used but not broken or cracked and will function as designed. Made from heavy duty plastic for industrial use. Industrial Gray color. Side handles make transporting the bins a breeze. Each bin holds up to 75 pounds and measures 19.75 inches wide x 12.5 inches high x 15.25 inches deep. Sold as a set of 3 bins Bins are used but not broken or cracked. 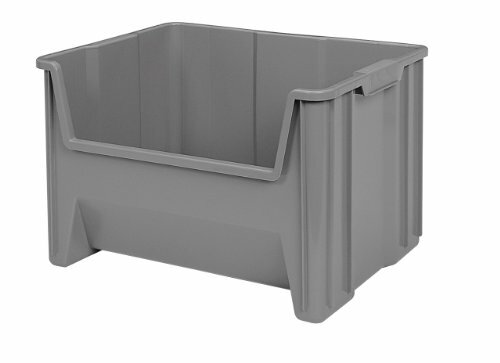 Bins are ready for use in your warehouse home or shop. Round Dip-And-Drain Basket: 9-1/2"Dia. x 12"H (approximate outside dimensions of mesh lined area excluding handles, overall outside dia. is 10-1/2" with feet folded under), 1/4" Dia. Rod Frame, All frame joints TIG welded for strength, Swinging Round Loop Handle, Handle Height=1/2 Basket Dia., Lined bottom and sides with 4 Mesh x .063" Woven Wire (4 mesh wires to the inch, each wire .063" dia., .187" Openings, 56% Open Area) fully resistance welded into the frame and ground smooth, 304 Stainless Steel, Natural Finish, BUCKET NOT INCLUDED, Est. wgt: 6 lbs., (Manufacturer's Part #DND-095RND120-C04S, UPC #731882464290 ). Akro-Mils Hanging file plastic Tote Attached Lid Container 21.5" x 15" x 12.5"
"""THIS IS WHAT YOU NEED The bluetooth speaker pouch was made of the leading quality with vastly benefits that others products don't have. Therefore we believe that this items will definitely satisfy your need"""
PREMIUM MATERIAL: These mini speaker box were totally made of premium qualified material, with the leading production technology. Definitely durable and will bring the highest efficiency. GREAT FUNCTION: It helps you protect your bluetooth speaker from dust, scratches. You wll not worry about your broken bluetooth speaker thank for this useful bag. PORTABLE: Comes with a comfort shoulder strap for easily carrying all of your bluetooth skeakers wherever you go. It is lightweight and not large so you can put it in your pocket or bag. OUR MESSAGE: We make sure that we always provide the best customer service and bring the best shopping experience to every customer. If the bluetooth speaker pouch has any quality issue, please contact, we will reply as soon as possible. NOTE: Our normal delivery time is within 15-20 days. If you ordered our item, we can not cancel your order which is being shipped on the way. 1 Drum Modular Platform - Yellow with Drain. HOW WE'RE DIFFERENT: Our bags are simple, tough and to the point. Keep your smaller loose items like nails, bolts and screws in one place. We only use the highest quality canvas material and metal zippers that work and will not jam or get stuck. DEPENDABLE SMOOTH SLIDING METAL ZIPPERS: Long lasting zippers that strengthen the pouch opening and provide easy access to all of your materials. ORGANIZE OTHER AREAS OF YOUR HOME: These functional bags are perfect for your garden tools, arts and crafts, office supplies, banking, woodworking, electronics, and networking accessories. LIFETIME GUARANTEE: Size: S:18.5x11cm and will accommodate most small to medium size tools, parts and accessories. Our durable bags will hold up to tough abuse. More importantly, they will keep you organized, or your money back! Metal Decorative Caddy Organizer for home or office, business indoor outdoor decor use. Comprised of outer basket and four compartment caddy that can be used as separately or nested. Great to organize tools and supply in the kitchen, office, garage, pantry, bathroom, shop for inside or covered outside space. Made of thick quality metal with vintage, antique, weathered appearance. Add this charming storage solution to your rustic metal decor. Measures approximately 8" W x 8" L x 9" H with wooden handles for easy carrying and utility. KITCHEN OFFICE SHOP GARAGE ORGANIZER: Great to organize tools and supply in the kitchen, office, garage, pantry, bathroom for inside or covered outside space. RUSTIC VINTAGE INDUSTRIAL DISTRESSED: Made of thick quality metal with vintage, antique, weathered appearance. Add this charming storage solution to your rustic metal decor. TOOLS GARDEN CLEANING SUPPLY: Functional decorative piece for use in the shop, store, studio to add rustic charm to your living, storage or work space. WEATHERED ANTIQUE DECOR: Measures approximately 8 W x 8 L x 9 H with wooden handles for easy carrying and utility. Brand: P.P.D. | Manufacturer: P.P.D.